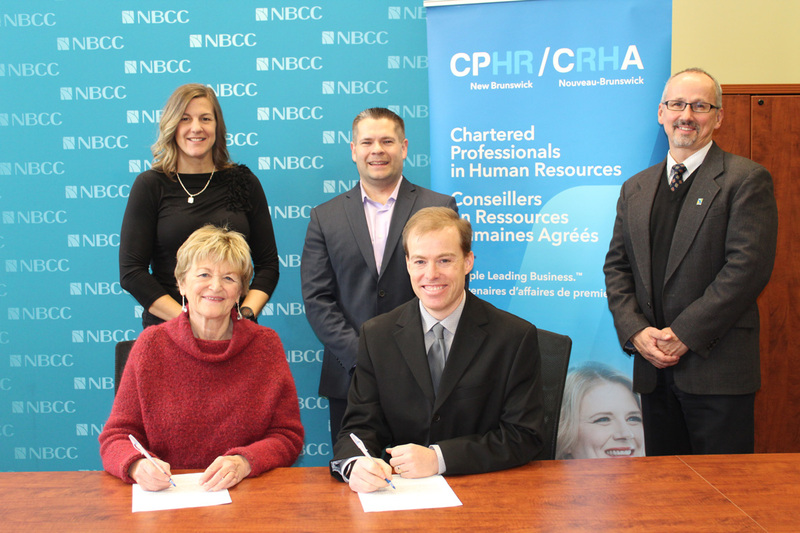 NBCC President and CEO Marilyn Luscombe (seated, left) signs an accreditation agreement with CPHRNB President Jason Scarbro. Back row, left to right, NBCC VP Academic and Research, CPHRNB Executive Director Luc Page and NBCC Dean of Health and Business Administration, look on. FREDERICTON – New Brunswick Community College (NBCC) recently reached an agreement with the Chartered Professionals in Human Resources New Brunswick (CPHRNB) for accreditation and a pathway to professional certification for graduates of the Human Resources Management program. This will apply not only going forward, but also to alumni of the program who graduated within the last five years. Luscombe said the new agreement highlights the importance of partnerships in NBCC’s agenda for growth, as well as the strong relationships NBCC is continuing to build with business and industry across New Brunswick. “CPHRNB is excited to welcome NBCC to our organization as we both add value to prospective human resources professionals in New Brunswick,” said CPHRNB President Jason Scarbro. “This agreement will ensure that the CPHRNB professional standards are upheld as we strive to meet the need for this growing segment of the employment market. “This is our first accreditation agreement in post-secondary in New Brunswick. NBCC has met our accreditation standards and we are excited to develop a long-term relationship with their organization as we both work to enhance the human resources profession in our province. The accreditation means that graduates of NBCC’s Human Resources Management program will be recognized in their field as possessing a professional standard of knowledge and proficiency. It also opens pathways to professional certification for graduates. The Chartered Professionals in Human Resources New Brunswick was established in October 1996 to meet the needs of HR professionals in our province for their growth and recognition. The association’s mandate includes attaining recognition as a resource on employment issues, as well as promoting and gaining acceptance of the Human Resources field for the distinct body of knowledge it provides in business. Its purpose is to promote and encourage members to develop and maintain a professional standard of knowledge and proficiency in its occupational field. With over 90 programs and six campuses across New Brunswick, NBCC is a provincially-recognized post-secondary institution known for producing skilled, knowledgeable college graduates. NBCC offers students full-time concentrated study periods in one- and two-year certificate and diploma programs. For more information, visit: www.nbcc.ca.